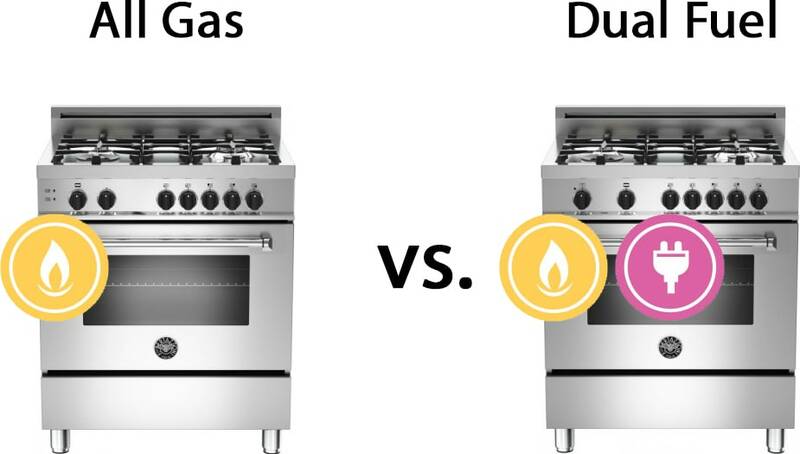 Gas vs. Dual Fuel Ranges: Which Is Right for You? Choosing a range for your kitchen can be a very personal decision, one that can have long-lasting effects for you and your family. There are a wide range of considerations to take into account—do you do a lot of cooking? What about baking? Odds are that if you’re taking the time to research the advantages and disadvantages of gas versus dual fuel ranges, you’re likely the kind of person who is interested in getting the absolute best for their home. So let’s break down some information about gas and dual fuel ranges and look at the pros and cons of each, as well as the installation requirements you’ll need to consider before making your decision. What are the components of a range (also referred to as a stove)? A range is made up of a cooktop, the top cooking surface, and an oven. Typically, customers will use either an all gas range or an all-electric range—there’s only one fuel source. In gas ranges, gas powers both the cooktop and oven. This applies to electric ranges as well—electricity powers both the stovetop and the oven itself. Over the last several years, ranges with gas cooktops have become increasingly popular as consumers have become more comfortable using them. As opposed to an electric cooktop that gives no visual indication of how or cold the current setting might be, a gas cooktop offers a visual cue by way of a flame that can be adjusted in size and heat. Gas is also an extremely efficient fuel source, as the gas is turned directly into heat. Electric cooktops result in some energy loss when converting from electricity to heat. Additionally, gas is known to react very quickly. As soon as you change your gas setting, the pan immediately begins to react and change its temperature. This is in contrast with electric ranges that take time to cool down to lower temperatures. While electric induction ranges have been striving to fix these issues, we still believe that gas cooktops are most effective for the average user. A dual fuel kitchen range aims to combine the best of both worlds. The cooktop is gas while the oven is electric. Because electric ovens tend to create more heat, resulting in more even and consistent results for baking, electric ovens are generally preferred to gas. If you were to set your temperature to 350 degrees in a gas oven, the flame will have to continuously turn off and on to maintain that heat. This is not only inefficient from an energy standpoint, but also results in temperature fluctuations and a less consistent cooking temperature. However, with an electric oven you can all but guarantee that your food will be baked at right around 350 degrees. Aside from baking, a gas oven will generally work just fine for your needs. We’ve even seen some anecdotal evidence that gas ranges preheat faster than dual fuel ranges (excluding special models with fast preheat options.) So if you don’t bake and you hate waiting for your oven to preheat, a gas range might have a slight advantage over a dual fuel range. What will I need in my home? A gas range requires a gas line in your home, while a dual fuel range will require both a gas line and a 208/240-volt power line with at least 30 amps. You should always double-check the manufacturer’s specifications of any machine in order to ensure that you have enough power running through the electrical circuit to the fuel range. If you’re planning on replacing a preexisting gas range with a dual fuel range, you’ll need to have an electrician add a new circuit to your electrical box and run a line through to your range. On average, we’ve seen the cost of this work run anywhere from $300-$500 depending on the specific conditions of your home. If you’re going to go for a dual fuel range, we’ve compiled this list of some of the best available on the market. Each one has its own unique advantages, but they all represent a high level of quality and feature sets that will almost certainly meet and exceed all of your needs. This impressive dual fuel range boasts a relatively low price point and tons of features that you’ll love. The long center burner is perfect for long pans used in fish frying or griddle frying. With WiFi connectability you can keep tabs on your oven even when you’re not at home, especially when it comes to using the included roast probe to keep track of the internal temperature of your cooking items. With a high-end appearance at a relatively affordable price, this Bertazzoni dual fuel range is an Italian workhorse from a company that’s proven its reliability over the years. At 4.7 cubic feet, the oven cavity is one of the largest in the market. Cooking performance is excellent and the combination of price and style is tough to beat. With their Chef Collection, Samsung has continued to raise the bar in cooking performance as they tackle the home chef market head-on. This range features two separate oven doors, allowing for two separate temperatures in the top and bottom of the oven. The flexibility this offers is obvious, and this oven also boasts an impressive 22,000 BTU burner which will boil water at lightning speed. Wolf represents the absolute pinnacle of cooking performance, and you’ll find Wolf ranges in many of the finest homes and kitchens around the world. With Wolf, you receive extremely high-end build quality and commercial grade cooking performance. Double stacked burners give you precise control over your cooking surface temperature, and the dual convection oven consistently gives even and dependable baking & cooking results. This is the range that will inspire you to cook dishes you never thought possible. Miele is perhaps most popular for their line of high-end dishwashers, but over the last few years they’ve been introducing their own Miele Ranges in the North American market to widespread acclaim. Why? They offer the same high-end design, strikingly elegant good looks and uncompromising performance that have long been hallmarks of Miele machine. Miele also bakes a great deal of technology into their ranges that many other manufacturers neglect, including a touch control panel that gives you automatic setting options for cooking almost any dish to perfection. If you have any additional questions about dual fuel ranges or the models and manufacturers available, contact Designer Appliances today!